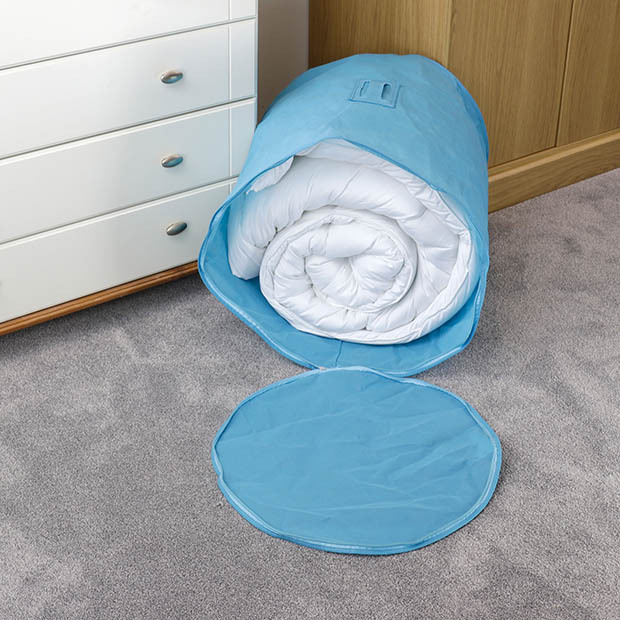 One single packaged zipped duvet storage barrel bag in breathable light blue polypropylene material. Large enough to fit a single, a double or a king size duvet. Brilliant for pillow storage also - will fit 2 or 3 depending on size. Moth & dust proof. Holds a king size duvet or a double duvet with pillow. End opening with strong zip fastening. Helpful label window and carry handle. Also useful storage for out of season clothes, blankets, clothing & laundry. Excellent space saving storage - stylish, strong and durable. Size: Length x Width 24'' x 20'' (60cm x 50cm) approx.